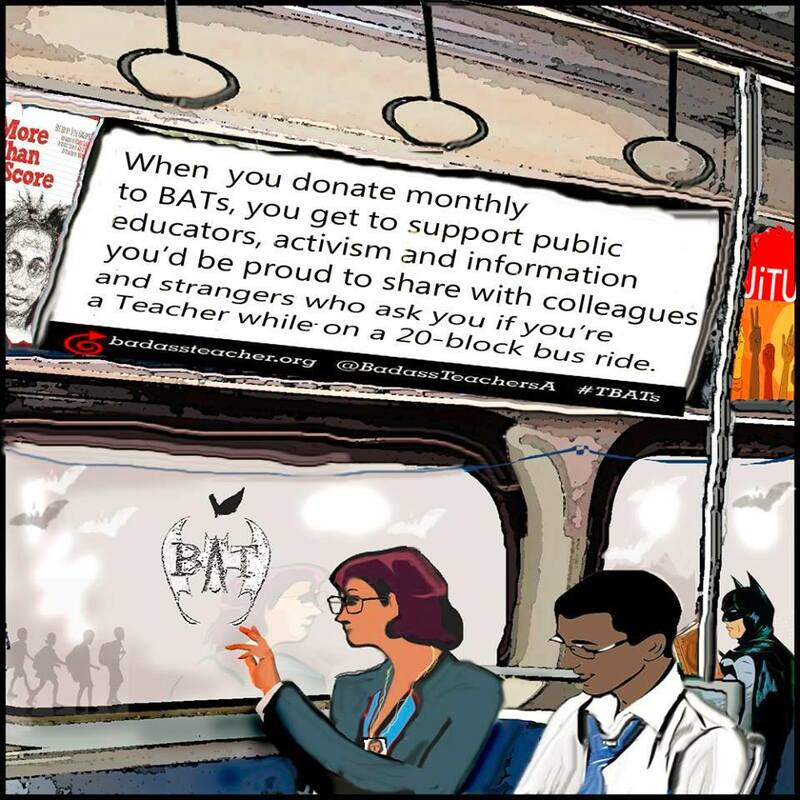 Badass Teachers Association Blog: Why You Should Donate Monthly to the Badass Teachers Association! 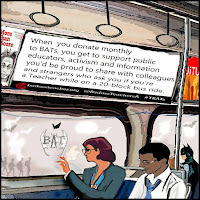 Why You Should Donate Monthly to the Badass Teachers Association! As we grow larger, and build more relationships with other organizations, we are often met with surprise when the conversation turns to money. People that are not familiar with BATs are often surprised to find out that we are a volunteer organization. They want to know the salaries that we get paid. They inquire about job openings, and opportunities for part-time work. They find it hard to believe that for us, this is out of love, out of need, out of necessity. For many of us, directors and members alike, BATs was a light shining in the darkness. It became a place for us when we were getting lost in the middle of standardized tests, VAM, SGO's, SLO's, student anxiety, educator angst, long days, and ever-increasing paperwork. 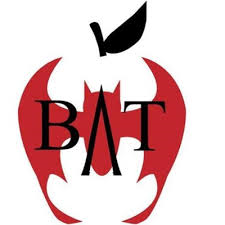 For many of us, BATs has become not only a group of educators, a network of activist, a circle of friends.... BATs has also become our family. We have always survived on the generosity of our supporters through donations, our monthly subscribers allow us to finance the backbones of this organization. We are able to maintain our partner subscription to Action Network, keep our website running. Taxes, legal and accounting fees, postage expenses get covered. It funds our BAT swag - buttons, bracelets, etc. - which we gladly hand right back to you with a smile. We are able to sponsor pro-public initiative, advertising, and publications. Even bus ads in Seattle for test refusal. Your donations help us boost posts on Facebook when there is an urgent need. But above and beyond what we need to maintain this organization, we direct monies to support others. We established a grant program and have given out student scholarships each year to help education students and student activists. Award winners have been Chastity Berrios (Fairfield University); Student activists Tanaisa Brown and Nidalis Burgos, and last year to Trinity University education students Melissa Dunn and Elsa Arias. BATs has donated to those in need, whether it be survivors of natural disasters or those standing up to fight against hate. BATs donated $500 to Harvey Relief efforts (targeted Navarro Middle School - school of Houston BAT Daniel Santos); $200 sent to Mexico to help a school impacted by the earthquake; $500 sent to the FMPR (teachers union in Puerto Rico): $200 to DeAndre Harris who was beaten by white nationalists in Charlottesville, and $500 to the publishing of Black Lives Matter in School as well as monetary support for organizations holding events during the Black Lives Matter at School Week of Action. Support was sent to Chicago parents that were fighting for an elected school board, Dream Yard Project, Philadelphia Students Union, and organizations exposing the Flint Water Crisis. Support has been given to assist people that represent our values and our mission. Social media alone is not enough to build a movement! The People’s Summit in Chicago, Network for Public Education, Progressive Education Network; Free Minds Free People; #WeChoose National Coalition events in Chicago and DC, BATs went to DC and met with the education aides of Senator Sanders and Senator Hassan prior to the DeVos vote, a BAT representative went to The Facebook Summit, BATs Executive Director Gus Morales trip to Puerto Rico to show solidarity. Of course, we cannot leave out our major initiatives, our own rallies and conferences, from coast to coast, Washington DC and Seattle and the filing of an Amicus Brief to fight Friedrich vs CTA. - feel better knowing that any little bit that you can donate is going towards public education advocacy that tries to represent your voice and the voices of our students!